Bodhgaya is on the brink of transformation. 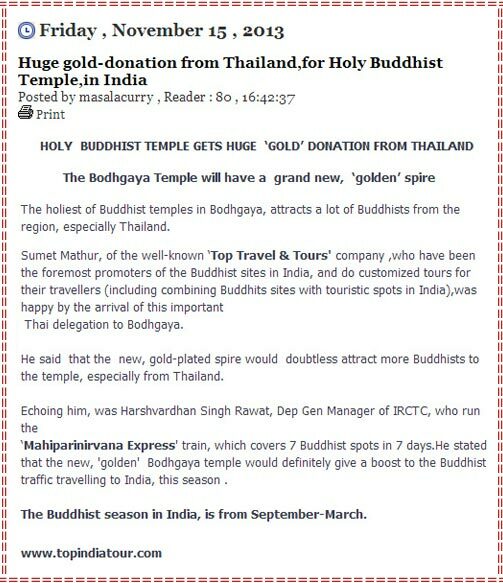 Around 300 kg of gold received as a donation from Thai king and other Buddhist devotees will be coated on the spire of the Great Bodhi Tree. This is seen as a great development among the Buddhist world. Mr. Sumit Mathur, Director of Top Travel and Tours (P) Ltd. a foremost promoter of Buddhist Circuit in India and Nepal spoke about the upcoming tourist boom, especially from Thailand in the Buddhist sites of India. Around 2600 years back, a Prince walked through the path which still is followed by the millions in search of an ultimate awakening. In pursuit of this enlightened path, he surrendered every pleasure and comfort to become a practicing ascetic. He disciplined his senses, imposed physical pains, starved his body by fasting and induced self-mortification. Still unsatisfied by the pain and physical weakness, he started following Middle-Path between two extremes. That wisdom path only led that Prince to become enlightened, the Buddha. A modern day Buddhist Pilgrim is blessed for the reason that he doesnt have to go through such drastic wandering experiences. For him, there is a Middle Path, avoiding all extremes and serving him with convenient options to explore the regions in their truest essence. Reaching the Buddha land is much easier and comfortable nowadays, thanks to the technology including easy airways, extensive train network, mobile phones, high-speed internet, savvy travel agents and a wide range of guidebooks. One such guidebook, Along the Path the Mediator's Companion to Buddha's Land by Kory Goldberg and Michelle Décary has everything a Buddhist Pilgrim requires while exploring the Indian roots to Buddha and Buddhism. Inclusive of various sacred sites in India and Nepal, the book serves well to the tourists who are not well versed in speaking English through user-friendly tips, maps and Indian vocabulary used in daily basis. The hidden stories of Stupas, Pagodas, Chaityas, Temple and Monasteries, Asokan Edicts, Monastery Remains and the rediscovery of Buddha and Buddhism is also well documented in this work. 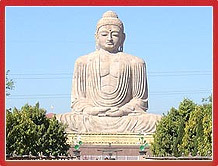 To explore the sites to their best possible levels, these Canadian authors have recommended www.buddhist-pilgrimage.com, the website owned and operated by Top Travels and Tours (P) Ltd for suggestive itineraries and elaborated tours to Buddhas Land and Middle Land including recently excavated sites and ruins scattered in various Indian states. (See page 78 of Along the Path the Mediators Companion to Buddhas Land).